Drix: Oh my, what big zits he has. How does something like this happen? 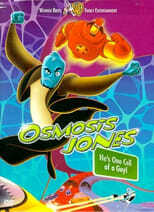 Osmosis Jones: You wash your face with fried chicken, that's how. Leah: This thing is huge. Osmosis Jones: Don't be all impressed 'cause 99 percent of that, is just sugar, ya know. Leah: Yeah, and 99 percent of you is just stupid. Osmosis Jones: I bet Johnny Streptoccocis in the Melanoma family would be very interested to hear about your flu shot work. Flu Shot: You can't jack me on that brother. I'm in the Virus Protection Program. Osmosis Jones: In the words of the immortal James Brown, get down! [To Frank] What a zit! I mean, what is it? What do you want? Funny. He dosn't look fluish. Honey, the reason that monkeys eat so many fruits and vegetables is because they're not smart enough to butcher a cow. Your mother - God bless her soul - she didn't believe the old-fashioned ideas about nursing and breast-feeding and all that. Uh-uh, you were fed cheeseburgers as a baby, and look at you - you're as big as a house, you're as strong as a bull, you smell like a cow. Your cholesterol's probably a little high, but they have medicine for that now. You can get an angioplasty, get it all cleared out. Osmosis Jones to dispatch. We got multiple germs coming down the windpipe and if these bad boys hit the blood stream, we're going to be illin'. You see this badge? You see this gun? You see this white saccus membranous around my personhood? You're talking to a white blood cell here! I should be in the veins fighting disease, not up in the mouth on tartar control. [Drix shoves his gun arm into the flu shot's mouth and Osmosis gets an idea] Uh-oh, you done done it now, brother. You had your chance with me but now you got Psycho-Cop. He's Cuckoo for Cocoa Puffs! He's going to go 'El Pueo Loco' on your crazy behind! [first line] Special Agent Drixo-Benzo-Medapedramine. [changes tone of voice to more commercial-friendly] Drixnol! The brand that eases your coughs and sneezes! [The Chief asks Jones where he was in their conversation] Uh, you were just talking about promoting me to head of brain security.